After idling in the Senate, two controversial immigration bills — ending in-state tuition for some undocumented immigrants and barring sanctuary cities — are apparently back in play. But it remains unclear whether sponsors have the votes to bring the measures up for debate. After being made eligible Tuesday for a possible floor debate in the Texas Senate, a controversial bill to eliminate in-state tuition rates for some undocumented immigrants has been placed back on the shelf. At least for now. Senate Bill 1819, by state Sen. Donna Campbell, R-New Braunfels, was taken off the upper chamber's intent calendar for Wednesday, making it ineligible for consideration for at least another day. It remains unclear whether Campbell will be able to muster the 19 votes needed to bring the measure up for debate. Her bill would do away with what has been standard policy in Texas since 2001: allowing non-citizens, including undocumented students, to pay discounted in-state tuition rates at public colleges and universities if they have lived in Texas for three or more years. The proposal was originally placed on the Senate’s intent calendar on April 15 after an hours-long and emotional committee hearing — but was taken off that calendar next day. During the first 130 days of the session, Senate rules require a bill to stay on the calendar for two days before being brought up for debate. SB 185 has been on and off the intent calendar several times since passing out of committee on April 13, a sign that the measure didn’t have support from 19 senators. The upper chamber’s 11 Democrats have stood united in their opposition to both measures, and at least two Republicans are firm against it. State Sen. Craig Estes, R-Wichita Falls, told The Texas Tribune on Monday that he still had “great reservations” about both measures. “As a conservative I think both of those bills have some unintended consequences that could be dire,” he said. 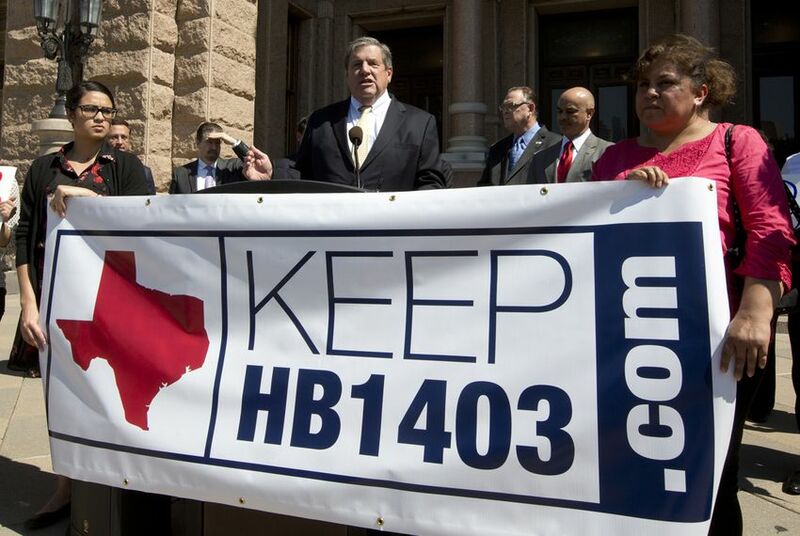 And state Sen. Kevin Eltife, R-Tyler, reiterated on Monday that he’s against both bills. That means one Democrat would have to join the Republicans to bring the bill up on the floor. Even if that happened and the Senate voted the bills out, the clock is ticking. Saturday is the House's deadline to pass Senate bills out of committee. The House has also had less of an appetite for those measures than the Senate, which means SB 1819 and SB 185 could languish there until June 1 — the end of the current session.